A zoomed-in view of the dwarf planet Ceres, seen from a distance of 238,000 miles (383,000 kilometers) by the Dawn spacecraft on Jan. 13, 2015. The image hints at the presence of craters and other features on Ceres' surface. A spacecraft closing in on the dwarf planet Ceres in the solar system's asteroid belt has captured tantalizing new views of the huge space rock, revealing hints of craters and other structures on the surface of this mysterious body. NASA's Dawn spacecraft snapped the new images of Ceres, which is the largest object in the asteroid belt between the orbits of Mars and Jupiter, on Jan. 13. Scientists unveiled the images on Monday (Jan. 19). "The [Dawn] team is very excited to examine the surface of Ceres in never-before-seen detail," Chris Russell, principal investigator for the Dawn mission, said in a statement from NASA's Jet Propulsion Laboratory in Pasadena, California. "We look forward to the surprises this mysterious world may bring." The dwarf planet Ceres is about the size of Texas, with an average width of 590 miles (950 kilometers). It is the largest object in the asteroid belt but the smallest known dwarf planet in the solar system. The Dawn spacecraft will be the first spacecraft to study Ceres — or any dwarf planet — up close. By the end of January, Dawn will obtain higher-resolution images of Ceres than the Hubble Space Telescope, NASA said in the statement. The new images from Dawn were taken at a distance of 238,000 miles (383,000 km) and are three times sharper than a batch taken in December, which were used primarily to calibrate the spacecraft's instruments. 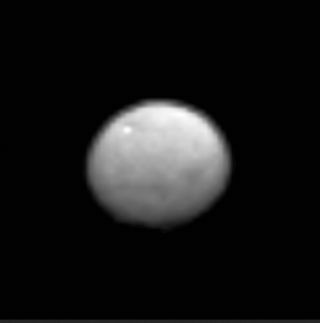 The dwarf planet Ceres, seen from a distance of 238,000 miles (383,000 kilometers) on Jan. 13, 2015, by the Dawn spacecraft. Ceres was discovered in 1801 by Sicilian astronomer Giuseppe Piazzi and was initially considered a planet. But when scientists later discovered that Ceres was just one of many objects in the asteroid belt, it was reclassified as an asteroid. In 2006, Ceres' classification changed once again — this time, to dwarf planet (in order to gain full planet status, Ceres would need to gravitationally clear its neighborhood of debris). Today, Ceres enjoys joint classification as both an asteroid and a dwarf planet. Earlier this year, scientists announced the discovery of water on Ceres, in the form of vapor plumes that erupt into the sky. The plumes may come from volcano-like ice geysers. The vapor gives Ceres a bit of an atmosphere, and scientists wonder if there may also be liquid oceans beneath the surface.